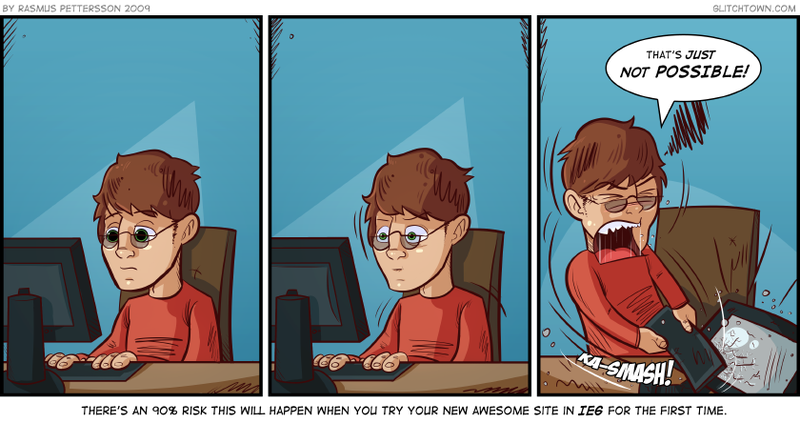 If you’re a web designer, I’m sure you can relate to this. I plotted this strip right before my brother visited me this weekend. And while working on a site with him (still this weekend), we ran in to almost this exact problem. The computer’s still working though. This entry was posted on Monday, January 19th, 2009 at 6:00 am and is filed under Comic. You can follow any responses to this entry through the RSS 2.0 feed. Both comments and pings are currently closed. I do this for a living now; this pretty much sums up my work week. It’s kind of fun actually, in a masochistic kind of way. But seriously, I think IE6 is holding back the progress of the Internet. It had its day in the sun, but IE7’s been out for over two years now and IE8’s in the oven. If folks aren’t willing to switch to a better browser like Opera, Firefox, or heck, even Chrome, then they can AT LEAST take the 2 minutes it takes to upgrade to IE7. AMEN Danny, I agree completely, especially about IE6 holding back the progress of the Internet. Things would be so much easier if IE6 just disappeared from the face of the earth. ahaha – feel your pain there Rasmus! Great strip! That’s the way it ALWAYS is, things seem work fine in every browser. But then you open the site in IE and it’s all horribly, horribly wrong. Honestly, if there’s a problem with rendering the site it’s in IE and all other browsers work fine, just kill IE already. Thanks for the spellcheck moo! Can’t disagree with that cyberwasteland. I wish every browser would display sites the same way. There is a certain degree schism in developing websites that are IE6-compatible. On the one hand your pride as a developer (and for the sake of your clients) you should make the pages work in every common browser, but on the other hand it’s that kind of thinking that makes it easy for the people to avoid upgrading. One day, one sweet day, all commonly used browsers will be standards compliant and fallacies in the design will be attributed to the BROWSER and not the designer. Well said Michael. Well said. Avatar didn’t work, darn it. Sorry for the triple post. I said avatar, I meant “emoticon”.